BEIJING • Relatives of a dozen Chinese passengers aboard missing Flight MH370 filed suits against Malaysia Airlines, Boeing, Rolls- Royce and others yesterday, a day before the second anniversary of its disappearance, and a legal deadline to do so. Packed into a small office at the Beijing Rail Transportation Court, which has been designated to handle MH370 cases, they held manila folders with litigation papers in their hands. Ms Gao Xianying, 65, who lost her daughter, son-in-law and three- year-old granddaughter on the flight, said: "The date March 8 is like a knife that has stabbed us once again... Successfully filing the case is the next step in finding my family. 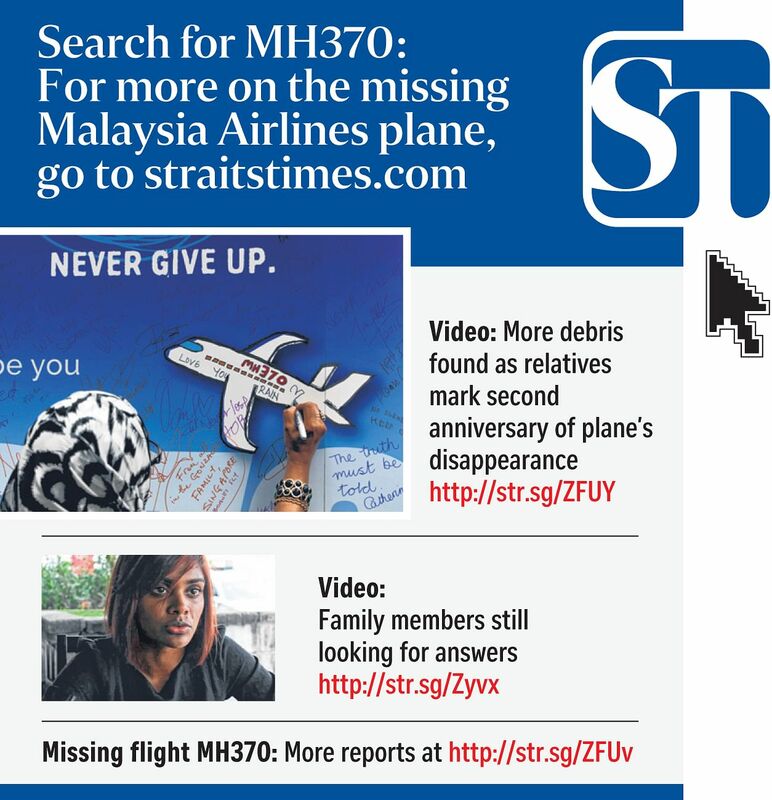 We're a step closer to demanding the truth from Malaysia Airlines." The Boeing 777 aircraft, with 239 people - including 153 Chinese citizens - on board, vanished en route from Kuala Lumpur to Beijing on March 8, 2014, and the authorities said it went down in the southern Indian Ocean. Under international agreements, families have two years to sue over air accidents. Lawyer Zhang Qihuai, whose Lanpeng firm represents the group filing suit yesterday, said many were "deeply conflicted" over the decision to go to court. The total compensation requested from Malaysia Airlines, Boeing, engine manufacturer Rolls-Royce and insurance companies ranged between 10 million yuan (S$2.1 million) and 70 million yuan per family, he said. Verdicts might not come for two years, he added. "Originally, many didn't intend to sue and wanted to continue waiting. But there's a time limit, so they have no other choice - losing the right to sue would be terribly painful." A vast Australia-led search of 120,000 sq km of the southern Indian Ocean seabed has so far failed to locate the wreckage, and the authorities plan to end the operation - projected to cost up to US$130 million (S$180 million) - if no new leads emerge by the time it is completed by July. Meanwhile, another possible piece from the missing plane was discovered last Thursday by a resident on the French Indian Ocean island of Reunion. Mr Johnny Begue, who found the "flaperon" wing fragment from the Malaysia Airlines aircraft last July when it washed up on the beach, said he handed over the new suspected object to police immediately. He said the object measured about 40cm by 20cm, and had a blue mark on the surface with a grey underside. He added that it was of the same lightweight "honeycomb" construction as the flaperon piece. Malaysian parliamentarians will observe a moment of silence in Parliament today led by the Speaker, who will deliver a condolence message during the session, Transport Minister Liow Tiong Lai said in a statement yesterday . He said an interim statement on the investigations conducted to date on MH370 will also be made public this afternoon .